Of the Garden. From the Garden. PANICALE, Umbria–There is no question about it. A garden ups the “degree of difficulty” of a home away from home by a factor of “lots.” But when it’s good . . . its very, very good. It is a happy place. With so many fun distractions. Much as I try to zone out and read and catnap, the Iowa farmer in me wants to study this year’s fig crop futures. Or to pinch off those two renegade weeds in amongst the wild strawberries. Or to lightly prune the plum. Or maybe check out . . . that bunch of clouds rolling up over the lake. Midge! Grab the magazines. I’ll get the laundry off the line! When push came to shove . . . .
TORGIANO, Umbria–I think the fact that we came here to Torgiano to celebrate our anniversary was very telling. A year ago it was Torgiwhat? We’d certainly never been in the village. (It is a bit left of Perugia and above Deruta) Oh, we’d heard “i voci” whispering about the wine museum, but I’m such a barbarian, I just couldn’t imagine such a thing. Turns out, I’ve only got two speeds on my wine analysis dial 1) hey, not bad. keep pouring and 2) Gack. no, no, choke, i’m fine, thanks. But our co-anniversary celebrants kept after us. And we thought, you know, they are such inveterate, non-stop, explorers – lets get over ourselves and go see the darn Wine Museum with them. Well. 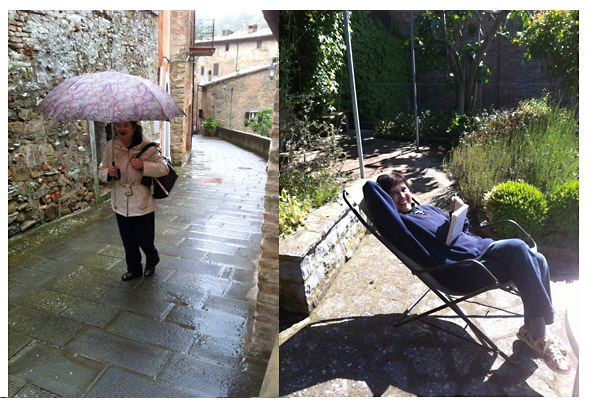 We spent over an hour at MUVIT last year one rainy spring day and hardly made a dent in the place. Loved every minute of it. They have every thing from the ancient, ancient, bet-you’ve-never-seen-one-of-these to knock-your-socks-off modern art. Thanks to their sugardaddy and founder Lungarotti Vineyards, everything is top drawer, world-class. Exceptionally well done and high art standard across the board. This year, on a rainy spring day we went to its companion museum MOO. Yes, as fluent as the site and guides are in English, they all seem oblivious to the fact that we think “MOO” is cow noise, but they think it is Museo Olio Olive . It was smaller than the wine museum but no less interesting. Both are worth the trip and both can be seen on the same ticket for the price of seeing either one. On the day we were there they were throwing in tickets to the wine tasting at the winery as well. Win-win. The previous year, post tour, we asked a guide where to eat. Specifically where CLOSE as it was raining buckets and some other museum-goers had “accidentally” walked off with my wife’s black and white polka dotted umbrella. The guide half leaned out the door and pointed to the corner of the street. And said “Giri, a destra all’angola, immediamente a sinistra, c’e Ristorante Siro.” This is where I would usually put a link to a deserving hotel/restaurant’s site. They evidently don’t have one. You can Google them, people like them and review them, but I couldn’t find a site per se. Regardless, we went and we were glad we did. And not just because we had shelter from the storm although that was in its favor. I would rank the food as wonderful, good vistas and personable staff who were the only people we ever heard speaking English. So there. Exactly how much did it ring our bell? When we had to cut our trip back from three weeks to one, we could see it would cost us jaunts to the dream duo Trieste and Lake Como. We thought what can we do to make this right? To come up with a worthy last-minute fill in that wouldn’t chew up all our precious time by riding about in a rental car? We voted and revisiting Torgiano/Siros won. We felt like we did too. It was an unforgettable string of laughing in the rain, Dear Diary moments. You can’t have one, you can’t have one, without the . . . other. 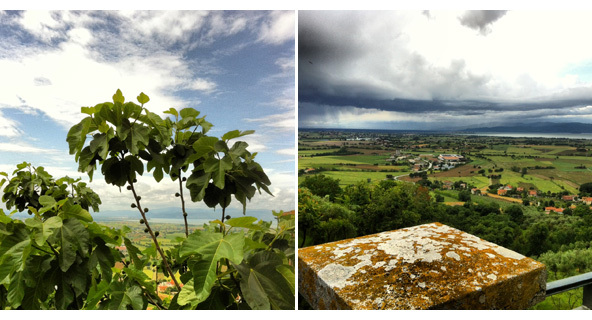 MAY IN UMBRIA, Panicale–Our favorite month in Italy is probably always going to be May. Why? Short answer is Roses. The longer answer is everything is so green, so full of hope, promise of sultry summer days and swallows and sunsets. But every now and then in May, you may want to know where your coat and hat are. And absolutely your umbrella and even gloves might feel good. Every moment of running back from Aldo’s with a coat over your head hiding from a sudden downpour is worth it, if for no other reason than for the roses. 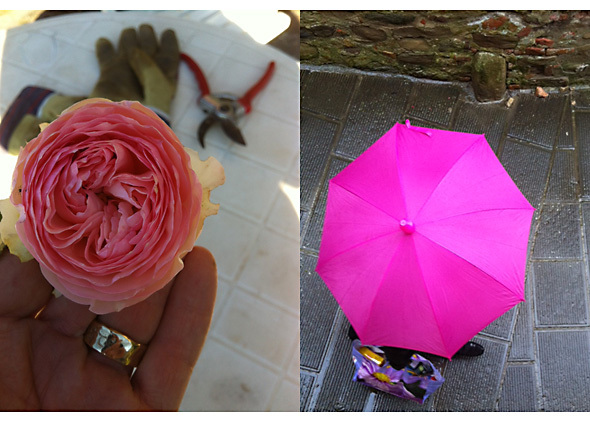 Whatever it takes to keep our new roses happy. One small bush, when seen from a walk by in the garden, seems a poor, underwhelming plant with no flowers to its credit at all. But, not so fast. Let us not judge this book by its cover . . . turn the page, move in closer and what the heck, it is over-producing. Its flowers are so dense and heavy that they point down like divining rods. Once we saw that, we just cut and then cut them some more. Roses for everyone. Roses on the house! Vases in every room. Bruna, (on left, below) of Ristorante Masolino fame, has been the ranking chef, with the most seniority and history in Umbria for years. She lives a few steps from us one way, and her restaurant is a few steps on the other side of us. So, we see her coming up or down the street in front of us regular as the tide on Casco Bay. You can see she’s wearing an umbrella and a parka. And trust me, she needed both. For that moment at least. Look past her on the right of the photo. That is the top of our garden wall. In the other companion picture, at another moment, is Midge at the bottom of that wall, basking in the sun albeit in one of my sweaters. We’d be in the house and all of a sudden we’d see the sun was out and in a flash we’d be in lawn chairs and feel like we were in a solar cooker. At that point “someone” would “be up anyway” (gardening) and get sent in the house to fetch sunglasses. And before they could get back, the world would turn black. The theater would go dark. Summer would become winter. Ma, va le la pena and worth the trouble too. In fits and starts, a chapter here, a page there, books were read, big thoughts mused, weeds met their final match. Glasses and spirits were lifted. And we put it to a vote, and we decided all was very right with the world. PANICALE, Umbria–This time our excuse was . . . our anniversary trip. We think it was well deserved. 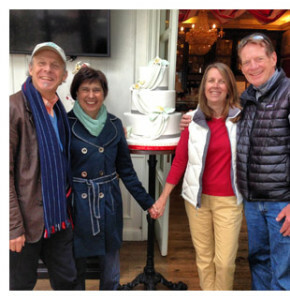 40 years for us and 40 for our best man, Harry and his wife, Alison. I was his best man and he was mine. I think Sandro said the simple way to relay that complicated relationship status was “eravamo testimone reciprocamente”. Tricky business, since Best Man implies a certain maleness I’d much prefer testimone ended in a clear-cut masculine “o” but no. Its that neutral “e” thing. Which is fine because technically it just means Witness. 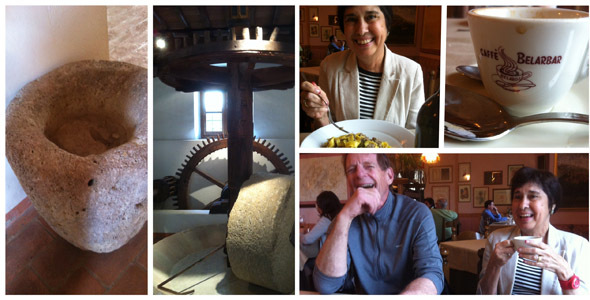 We all enjoy Italy and so here we were, celebrating up a storm at GMB pastries outside of Castiglione del Lago. Here’s to many more! Salute! You can tell by the scarves and coats it was shoulder season. Did we see you at the casino? CHURCHILL DOWNS, LOUISVILLE, KY – Sandro is our Sardinian Italian Language instructor from the Language Exchange in Portland. We do private lessons with him once a week when whenever we can. It gets technical. And specific. And then it spins out into wide ranging and freewheeling conversations. We were talking about our trip to the Kentucky Derby and that led to betting. And want to guess what the Italian word for Casino is? That’s right: casinò!. Emphasis on the end. Depending on the circles you travel with, usually you will hear the word without the ending emphasis. And that’s just a mess. Because without the accent it means “mess.” Well, technically it means “bordello” but somehow “che casino!” or “what a bordello!” has evolved to “what a mess!” Hey, wait a minute, Bordello looks like an Italian word too. See how much we owe Italians? 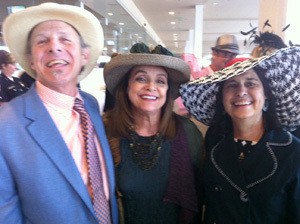 The photo is us with the indomitable Valerie Harper between races. we’ll try not to make too much of a casino.